So, it’s not obligatory to have a table tennis table to eat these beauties off……but it does help 🙂 It also helps if you can get your sticky fingers around some ice cold Cobra beers to wash these curried Scotch Eggs down with. 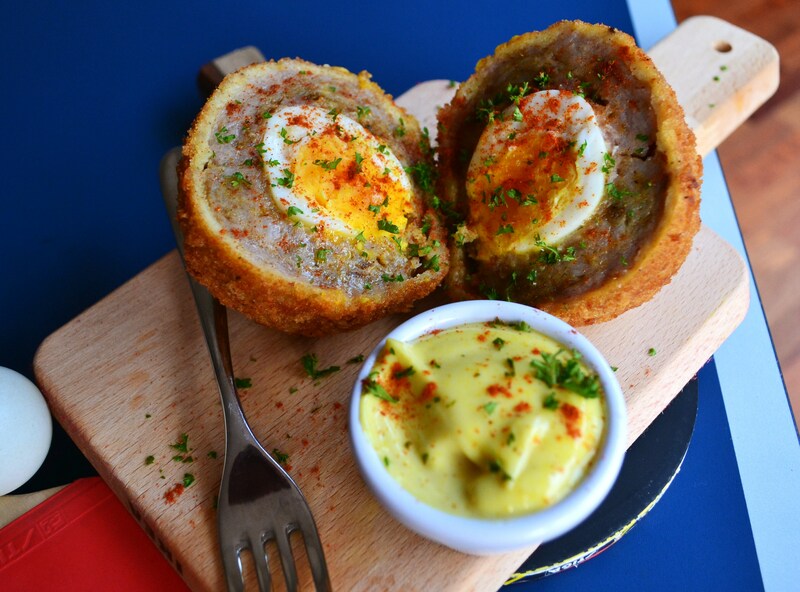 Scotch eggs until recently where the sole reserve of the filling station, frequented by taxi drivers and beered up students at 3am…..not anymore! The mighty Scotch Egg is now a firm fixture on gastro pub menus Country wide….and this is my celebration of this dam fine institution!! Kick off by boiling your eggs to your own preference…me..I prefer hard boiled…which has recently had me defending myself (looking at you Alan Lynam!). Cool then peel the eggs, feel free to lightly season the eggs with salt and white pepper and some curry powder. Next combine the madras curry powder with the sausage meat – at this stage I recommend taking a piece of the sausage meat, fry it and taste it for seasoning. If you are happy then split the meat into two 1cm thick patties…like burgers and plonk the eggs dead centre. Cup the sausage meat up around the egg gently and pinch closed to form a big meaty ball. You can leave the meat balls to firm up in the fridge for 10minutes or so, giving you them to set up your flour, egg-wash (1 eggs and the milk mixed) and bread crumb station. Remember, when doing this keep one hand for the dry and one for the wet and you wont make a mess! Roll in the flour, coat with egg wash, coat with breadcrumbs, roll back the egg wash the back in the breadcrumbs…this is the double dip method and will give you fantastically crispy Scotch Eggs. To cook simply deep fry at 170c until golden brown the finish in a pre heated oven 180c for 20mins or until the sausage meat is fully cooked through. Cut into two halves and serve with a mustard mayo and the chilly Cobras! Love scotch eggs. And there is always the health bonus! Did I get that right? Cheers fella…..’healthy’ and ‘scotch eggs’, dunno…I go running after eating these anyway so healthy is as healthy does I reckon! I do a fair bit of biking. I find, even at 55, as long as I burn the calories, I can eat what I like. And, of course, like what I eat.